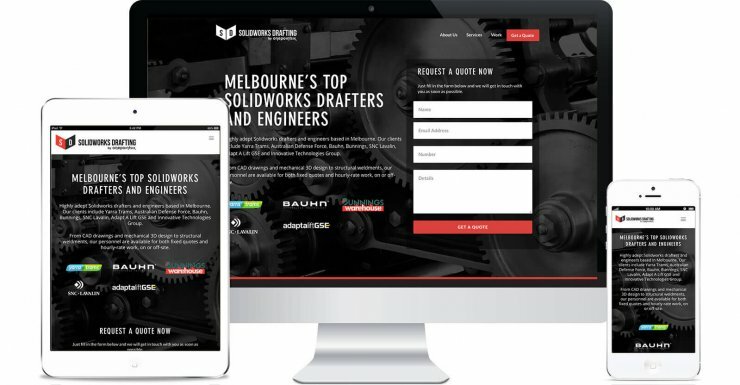 Solidworks Drafting Melbourne supplies top-tier drafters and engineers for both short-run and long-run projects. The venture comes from the guys over at OnePointSix, Jack and Kyle, who work in the same shared office space as we do. It’s not the first time they’ve worked with us, and this time around they wanted us to create a Lead Generation Website while also incorporating SEO into the process. Starting with a lead generation template, we customised it according to their branding and adapted their content to the website. With the target market being men around 30-50 years old in the engineering field, we chose a colour scheme with dark, strong colors, which would lean towards a more ‘serious’ energy while still standing out. We also focused on hitting the best practices for Conversion Rate Optimisation: having a form at the top, establishing trust signals including testimonials, and placing multiple calls-to-action throughout the landing page — All to set Solidworks Drafting up for lead generation success!